These are Metz Micro-Barb #2 saddles and grizzly saddles dyed by Jay Fair. 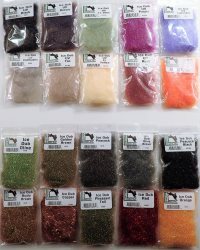 These are the colors I use for all my flies. Partridge is one of the more suggestive feathers to use on small nymphs because it moves and breathes when retrieved. I use it for my A.P. Emerger or you can use it for any soft-hackled fly. I would recommend buying it on the cape instead of packaged to avoid waste. Undyed only. Deer hair from a deer tail makes a perfectly silhouetted wing on streamer patterns. It's a good substitute if you don't have polar bear hair and can be accented by using more than one color. Just keep it sparse. Create your own color patterns especially using orange or some red in the wing. Remember, size is more important than color on minnow patterns. This material is a close match for polar bear underfur and can be used for the bodies of any small nymph, bugger or leech patters. It has a high sheen and realistic appearance. This is the best seal substitute I have ever used. I use it for my seal buggers, stillwater nymphs, diamonds, midge larva and dragonfly nymphs. 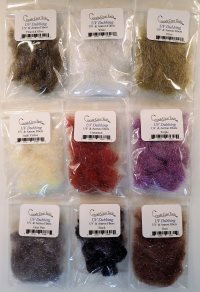 For suggestive flies, mohair spun is easy to apply by just winding it on the hood. 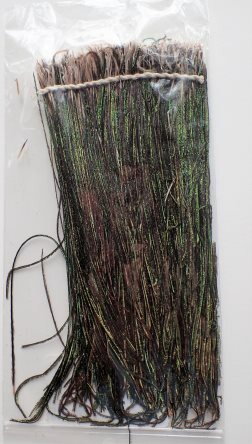 Abuggy looking material, mohair in its various colors can easily match nymph patterns for streams, rivers or lakes. The buggier the look, the more suggestive the fly appears to the trout. Ice Dubbing is a synthetic dubbing used as an attractor to mix with any natural animal body hair for the bodies of nymphs. I use it to mix with seals fur or african goat for my seal bugger and emerging bugger. 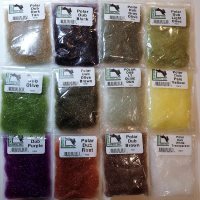 Holo Bright is another flashy synthetic material I discovered from a small fly tying materials company in Oregon. It became an instant hit when I used it for the thorax of my Stillwater Bug. Whether trout eat that fly because of this material’s attraction, or because of some other feature, I just know it attracts fish. 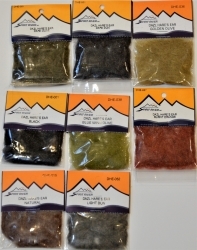 Holo Bright comes in 5 colors and I think you will like the results this material brings to your fly tying creativeness. Here's another outstanding dubbing material with added UV mixed into it. 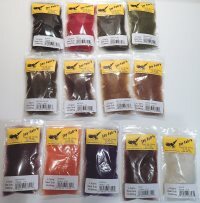 A variety of colors make it a must for the serious fly tyer when mimicking the natural insect. Next to my Seal Sub, Euro Seal is the best body material to come along in over a decade. What makes this special is we have added UV material to the Euro Seal. use it for the bodies of any fly and you will see the difference. Hare's Ear Dubbing is probably the number one dubbing material tiers use for their nymphs including the pupa and larva imitations. Suggestive, life-like, durable, easy to use, it has all the ingredients you need to imitate a mayfly, caddis, midge or damsel imitation. 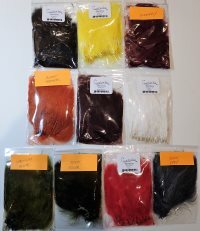 Here are eight colors for you to choose between that will match the sub-surface nymphs you plan to tie. This is the product I've found that makes my fly look the natural. Try it and I think you will agree. This is an excellent material for streamer flies or bugger-style patterns for big trout. These are 4-5 inch feathers and are excellent for my seal buggers, leeches shiner and chub minnow patterns. Maybe the best flash over tails and wings for any fly. Pearlescent in color, use four to six strands when tying your favorite pattern. Holographic Flashabou isn’t new, but it’s new on my flies. It adds flash and is an attractor especially during periods of low or no sunlight and in nutrient or off colored water. I don’t find it a good idea to use on small nymphs, however, it is a nice addition to the tails or wings of bugger style flies, leeches and minnow type patterns. Finally, a flashabou with UV mixed in. 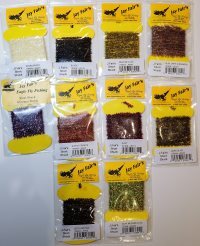 This is a must for placing over tails and wings that will add attraction and appeal to your flies. This is a fine cut flashabou type material that breathes and moves in a suggestive manner when retrieved. I prefer to top my flies with this material for added flash and appeal. This material has a high sheen appearance and can be seen at long distances beneath the surface even under low light conditions. This is a mini-sized crystal flash that I feel is more suggestive. Because of its smaller diameter, it breathes and pulsates more than the larger diameter crystal flash. I prefer to use it to accent my minnow patterns either in color tone or as an attractor. Usually 10-12 strands is enough to create a definite color segmentation or mix with other colors to get the reflection you want. You can add to or mix it on top with any hair or marabou color. I can tell you this, the trout seem to like it. Peacock herl may be the best body material ever used for trout flies. There is something about it that fish love. It certainly looks buggy and trout almost seem like they are attracted to it. I find it critical for my A.P. Emerger, Callibaetis Nymphs and Stillwater Nymphs. Three or four strands is about all you need to form a body that looks realistic or similar to the naturalâ€™s body. These packs come strung which makes it easy to pull what you need without breaking the stems. 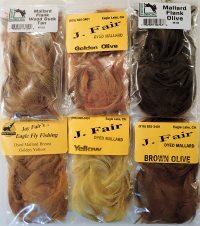 These are excellent colors dyed by Jay Fair. I use them for my callibaetis and A.P. emerger nymphs. I use moose hair for tails on my A.P. Emerger and Diamond patterns. Use a hair stacker so all the ends are even. Moose hair in dark brown or black make good looking tails on any aquatic insect pattern. Keep it sparse, 8-10 strands. I think every fly fisherman knows big trout eat forage fish (minnows) and small trout. Regardless of whether you fish streams or lakes, you need an assortment of highly suggestive minnow patterns. Rabbit strips tied over the top of the bodies of minnow patterns gives you a realistic, moveable wing material that works. The zonker is the best example of this style of pattern that I know of. These strips come in a variety of colors with varigated tops to match the tyers imaginiation. This is what I use for the backs of the Callibaetis Nymphs and/or Stillwater Nymphs. The shinny back matches the transformation stage of aquatic insects as they molt from larva to pupae to adult. 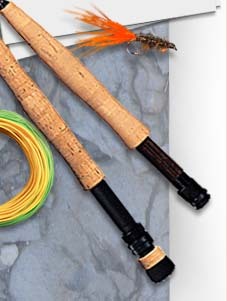 It makes your fly pattern more durable and realistic in appearance. Holographic mylar cord has a bit more flash that adds visibility in off colored water or during periods of low light. I use it along with flashabou tubing for the bodies of my shiner and chub minnows, but can also be used for the bodies of Zonkers or any minnow bodied fly. This material is the standard for the bodies of most minnow style flies. I use it for my Shiner and Chub Minnows. Be sure to wet the book shank with head cement before placing the tubing over the hook shank. Then press the sides of the body together with your fingers. I use this thread for all my flies since I started tying flies over 40 years ago, regardless of pattern or size. I use black for any weighted fly, olive for all unweighted flies and red or yellow when I want the head to match the insect. It's also an attraction thing. 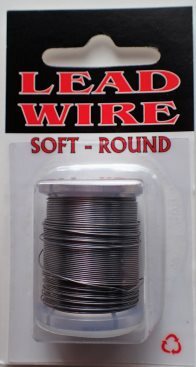 This wire comes in two sizes, .020 for my large suggestive flies like the Seal Bugger, Stillwater Bug or Leech patterns. For the small flies that I weight, I use the .015. I use mostly twenty turns on the .020 and anywhere from twelve to fifteen turns for the smaller flies. You may need to use less turns relative to the size of the fly you are tying. Easy to use and breaks with cutting.